Nearly 25 million Mexicans are getting a pay raise next week. From $4.25 to $4.70 -- a day. Mexican government and business leaders agreed on Tuesday to raise the country's minimum wage starting on December 1 to 88.36 pesos from 80.04 pesos. The 10% raise is good news for 24.7 million Mexicans who work either one or two minimum wage jobs. 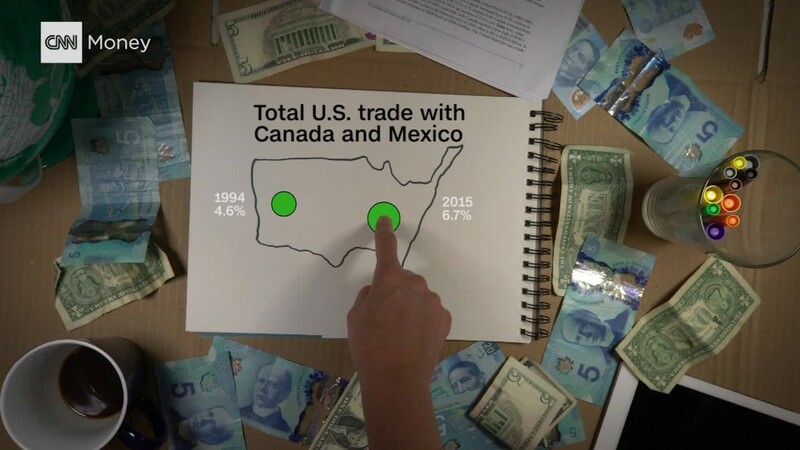 But it also resurfaces a key complaint by American workers who voted for President Trump, in part because of his pledge to renegotiate NAFTA, the trade pact between the U.S., Canada and Mexico. Trump blames NAFTA for the loss of many American jobs. Cheap labor has attracted American companies to Mexico for decades. The Economic Policy Institute's Robert Scott estimates about 800,000 U.S. jobs were lost to Mexico between 1997 and 2013. NAFTA became law in 1994. With the U.S. national minimum wage at $7.25 per hour -- $58 for an 8-hour workday, or 12 times higher than the Mexican wage -- Mexico has a clear advantage to attract jobs. It's one reason why the country frequently has a very low unemployment rate, which currently stands at 3.6%. By comparison, U.S. unemployment is 4.1% and that's considered very low by American standards. In fact, one of the Trump administration's objectives in renegotiating NAFTA is to have stricter enforcement of minimum wage laws across North America, though the issue has been most prevalent in Mexico. For Mexican workers, the wage hike is much needed as rising prices have weakened Mexicans' purchasing power. For nearly two years, the Mexican peso has hovered around its all-time low, roughly worth five cents. Seen the other way, one dollar has been worth between 18 and 22 pesos since early 2016.